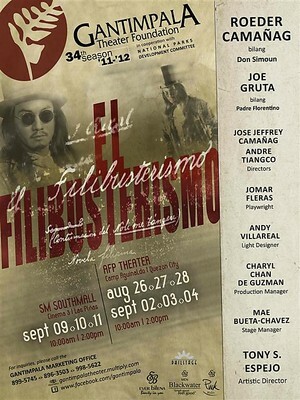 Directors Jose Camañag and Andre Tiangco stages El Filibusterismo under the production of Gantimpala Theater. “It is the intention of this production to reconstruct the face of greed as painted by the great Jose Rizal in this novel and to resonate Rizal’s definition of greed as the key evil that chains and enslaves the mind, heart and soul of a society away from the real path towards genuine freedom,” Camañag continues. “Through creative staging, powerful visuals, clear storytelling and moving music, we hope to usher and challenge the audience especially the students who will be watching this show as an aid to their curriculum, to look beyond the entertaining value of our production and try to listen to the remarkable messages embedded in Don Simoun’s confessions to Padre Florentino,” states Camañag. Giving life to the immortal character of El Filibusterismo are Roeder Camañag (Don Simoun/Mr. Leeds); Joe Gruta (Padre Florentino); Paolo ‘O Hara (Kabesang Tales); Ku Aquino (Padre Camorra); Mondrian Sampang (Padre Salvi); Dante Balois (Tata Selo/ Don Custodio); Alfred Urieta and Francis Cruz III (alternately portraying Basilio); Hazel Orencio (Juli/Pepay); Kristian Chua (Isagani); Flerida Capiral (Donya Victorina); Anna Deroca (Paulita Gomez); Jun- Jun Quintana (Juanito Pelaez); and Noel Escondo and Raymond Talavera (alternately playing Placido Penitente/Imuthis). For tickets, please call the Gantimpala Marketing Office at (63 2) 899-5911 and (63 2) 998-5622.